I understand this is a download only version. I understand this is for Windows only. 99% of our customers are academically verified without them having to do anything via our automated verification system. With SPSS predictive analytics software, you can predict with confidence what will happen next so that you can make smarter decisions, solve problems and improve outcomes. GradPacks are affordable, single-user licenses that provide students with essential analytical tools to support their graduate and undergraduate studies. Analyze your data with new and advanced statistics. The Advanced Statistics module offers a variety of new features within GENLINMIXED and GLM/UNIANOVA methods. Supports Bayesian inference, which is a method of statistical inference. Integrate better with third-party applications. 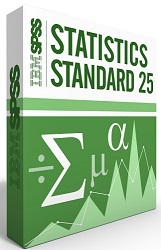 The IBM SPSS Statistics Standard Edition enables you to quickly "slice and dice" your data. Then you can create customized tables to help you better understand your data and easily report your results. Be ready for everyday analytical tasks with the IBM SPSS Statistics Standard Edition, and get results quickly and easily. Contact your sales representative to learn more and ask about our informative webcasts and newsletters on predictive analytics. To purchase thus product, you must be a student who is currently enrolled in an institution of higher education located in the United States to obtain a degree or participate in a continuing education program, for educational purposes and non-commercial academic research. Microsoft Windows 7(Service pack 2 or higher), 8 or 10 Desktops/laptops only. Packed with numerous enhancements that compare, not only with the TI-83 Plus, but with the TI-84 Plus models as well! Simplify personal and professional 4K/5K workspaces. Take the guesswork out of writing a business plan. Record documents and notes on the move in high quality & turn your speech into text. The best-selling Texas Instruments Graphing Calculator. Offers three times the memory, more than twice the speed and a higher contrast screen than the TI-83 Plus model.